1943 Austin K4 ECU (Escape Carrying Unit) fitted with a front mounted Barton Pump issued by the Home Office for use at Pembroke Docks.The Austin K4 (reg GXA 750) ECU served with the NFS (National Fire Service) and then passed onto the Pembrokeshire Fire Service in 1948.It was later moved from Pembroke Docks to Tenby before going out of service in 1973. This 1943 Austin K4 ECU is beleaved to be one of only 2 now remaining in presevation,the other being GXA 788 which is in the wartime colour (photo 7412) of grey.Photographed at the Odiham Fire Show in 2006,its still brilliantly preserved. Added by Rick Loudon on 27 August 2008. Thanks for that information Rick, would be nice if someone has photographs of GXA 745 and GXM 142 to send them into the site. 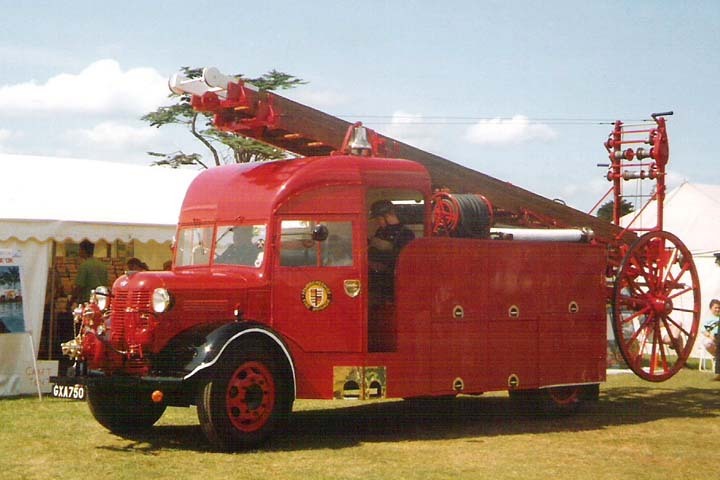 Added by Pete Matten on 28 August 2008.
this vehicle after 1948 made a brilliant job of it.Will send in to site.Pete. In your 27 Aug/08 Posting, are you sure "GXM 142" isn't really "GMX 142" ? Over, on Picture 10491, where "GMX 142"[in her beautiful post-war rebuild] is shown; there is a bit of confusion on these two Reg.'s . Keep up the good work - great to learn of these "Cinderella" war-time Engines being preserved for us. Added by Pat Rivers-Bowerman on 01 September 2008. I am putting in, an E-Mail enquiry, to the Northants Fire Service, re their Fire Museum in Northamptonshire, to see if they have a war-time Austin K4 Escape Carrying Unit, like the ones depicted on this 'Site; and, if so, what is it's Registration Number. In meantime, is it possible for any of our Devoted Readers, handy nearby, to pop in and have a look at the machine; and give us the number...? I cannot determine where, in Northants, the Fire Museum is - perhaps near the HQ Office in Moulton ?! It is a bit too far, to go my-self; I am about 2400 nautical miles away, as the crow flies[fitted with long-range tanks] across the North Atlantic Ocean. "GXM 142" is a Typo ? This is a great Fire Engine 'Site - keep up the good work. Sorry all, GMX 142 and GXM 142 was a typing error on my part, sorry for the confusion.Also Pat, I now have pictures of the Austin K4 ECU from the Fire Museum, the registration being GJJ 883.Pictures to follow shortly, OK.Pete. PS:-Its in a terrible condition, Museum did nothing in restoration to her. Added by Added by Pete Matten on 02 September 2008. Yorkshire, not the Fire Service Museum.Totally different place, sorry.Pete. Added by Pete Matten on 04 September 2008. What a brilliant picture, sister engine GXA 751 served at Holyhead in Anglesey North Wales for the NFS then purchased by Anglesey Fire Brigade 1948. If you require any more details of other Wartime appliances in Anglesey please let me know. Added by Graham Van Weert on 30 June 2011. If possible a full list with stations would be of interest please. Added by Neal Glover on 30 June 2011. Is that Ted Pither driving, and a young Mick Paull riding on the nearside crew seat. Adwest Engineering, Woodley were a very enthusiastic and proficient fire team in their day! Added by Alan Jones ex Berkshire on 01 July 2011. Alan, Ted Pither yes it could well be.Ted's owned this appliance for well over 20 years now and I remember it well from the old Southampton Show way back in the early 1990's. I'm sure when I took this photograph back in 2006, Mick Paull was actually driving around on his Wareham appliance also shown on this site and this was at the same time as this picture was taken, so no its not Mick. Added by Pete Matten on 01 July 2011. Added by Martin Cavaney on 12 January 2015. According to the last Odiham Fire Show programme held in 2013 (no show in 2014 due to weather) this 1943 Austin K4 is still owned by Ted Pither of Odiham, Hampshire. Added by Pete Matten on 14 January 2015. Would you have a contact address for him, we are planning a commemorative weekend in Pembroke Dock during August , where the appliance was stationed. Added by Martin Cavaney on 14 January 2015. Martin, I've contacted you via email-OK.
Added by Pete Matten on 15 January 2015.